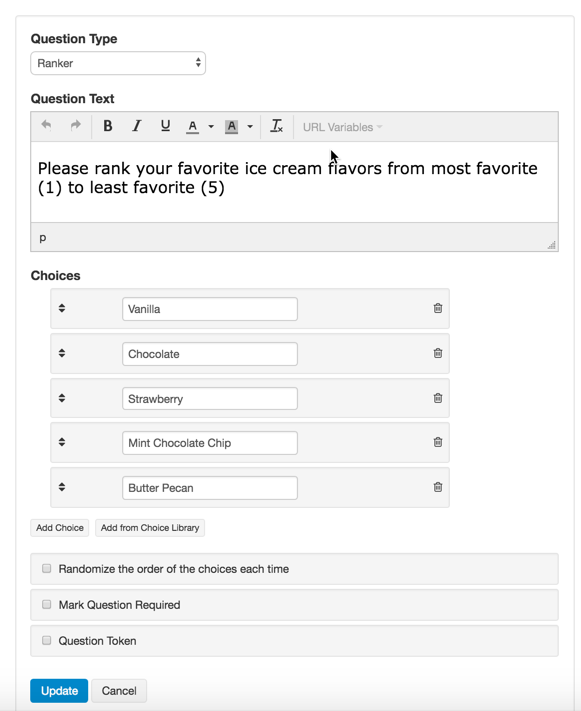 "Ranker" question type asks your respondents to rank something in order. So imagine asking your respondents to rank which customers what products or services they might be interested in. With "Ranker" question you can force your respondents to prioritize things. So in that ways you can drill down to what is the most important or most relevant. Let's say we were trying to judge which flavors of ice cream we should add to our menu. We could list the ice cream flavors and ask customer to rank them in order from their least favorite to their most favorite. Here's an how you create it. And here's what it looks like when published. We show the results in a table. You can see from the table below that Vanilla had the most #1s and Chocolate had the most #2s. NOTE: when we make the score the one with the highest score is the one with the positive responses. So in the below question you can see that Vanilla has a score of 3.77 and both Chocolate and Mint Chocolate Chip tied for 2nd place with 3.31.